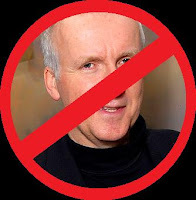 I recently had the opportunity to sit down with the one and only Non-James-Cameron. We talked about a little film you may have heard of called 'Avatar.' The following is a transcript of that interview. The Non-Review: Thanks for sitting down with me, Mr. Non-Cameron. So what was it like finally completing Avatar after almost a decade? Non-Cameron: Clearly you haven't seen the film yet. The Non-Review: No, I haven't had the opportunity. So you don't feel it's a good film than? Non-Cameron: I never said this. But I probably would have been more successful with a nice rom-com. Or maybe just filming a rock. The Non-Review: Wow. A little honesty is so hard to come by in this business. I applaud you for that. Non-Cameron: Wait, are you recording this? Non-Cameron: Whoa, hang on! Avatar is a great film! I was uh, just kidding about that earlier! The Non-Review: Of course. *wink* Now, there's been a lot of talk about the film costing around 400 million. This was of course denied by many people. What's the truth? Non-Cameron: No, no, no. Don't be so absurd. It must have been a good 500 million. I mean, 50. 50 million. The Non-Review: Freudian slip, I understand. I've also heard a lot of positive things about the CGI in the film, but that the story is just a worn out retelling of other stories; That it lacks originality. Would you agree? Non-Cameron: While the CGI is, in fact, one of the few redeeming factors, and that much of the story was based on films I'd seen before, I... it was.... what was the question? The Non-Review: Did you basically copy off other stories like Dune, Dances with Wolves, and your own earlier movies? Non-Cameron: Of course not! This one has robots! Non-Cameron: Oh no, that's just a rip off of - let me rephrase. Non-Cameron: We haven't seen anything similar to the concept of the Avatars. And there are robots. Cool ones, too. The Non-Review: Are they from the future, sent back to save humans? Little joke there. A few more questions if you don't mind. We here at the Non-Review recently had an exclusive review from Na'Muuch, an alien who claimed that you told him this would be a biopic on him and his race, but that you misrepresented him. Is there anything to this? Non-Cameron: Let me first clear something up. There were some strange plants on that planet, and I think that Na'Muuch might have been smoking something. With that out of the way, no, I think I really brought him and his people some justice. The Non-Review: He claims that a part played by a human in an avatar is based on him. Non-Cameron: Really? Did he say that? Wow, he clearly never learned the value of honesty, did he? Non-Cameron: Those Na'vi are crazy. Whoa, wait, you paid him? And what about me? The Non-Review: You didn't ask for anything upfront. Hope you learned a valuable lesson here today. Na'Muuch also said you misspelled it. It's actually N'avi. But let's step away from the content of the film for a moment. The Non-Review: What was it like to work with Sigourney Weaver again? Non-Cameron: Wonderful. She is a delightful person to be around, and I look forward to our upcoming project, Alien5. Ha, you have no idea how much she paid me to say that! Wait, did I say that out loud? The Non-Review: Yes you did, and I thank you for it. Well sir, you've been more than generous with your time. Any last thing you'd like to say to people before the big release? Non-Cameron: Please see it! It's not that bad, really! It's got everything, a beginning, a middle, an end! There's even some conflict! The Non-Review: Mr. Non-Cameron, thanks again for your time. Thanks to Ben H. Esq. (Non-Cameron) for the interview.